As the name slow cooker implies, a slow cooker cooks food very slowly, usually taking around 8 hours or so to cook most foods. In contrast, a pressure cooker cooks food extremely quickly, taking only a matter of a few minutes, but it still gives you the same flavourful cooking taste as a slow cooker. Many people call a slow cooker a crockpot. The name “crock-pot” is actually a name that is trademarked by a particular company that manufactures slow cookers. you can use a fast cooker. A person using a slow cooker or crockpot has to be extremely organized. Meals have to be prepared in the morning before leaving for work, so the meals are cooked by the time they get home in the evening. Because the slow cooker user has to be so organized, many people have purchased a slow cooker only to use it occasionally. Pressure cookers, on the other hand, can cook meals in minutes rather than hours allowing you to quickly prepare a meal in the evening after getting home from work. Unlike a slow cooker, there is no need to rush to prepare the evening meal before running out the door in the morning. 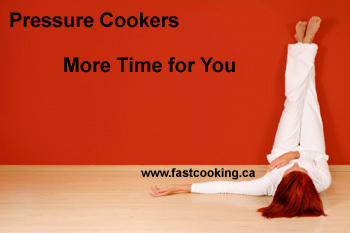 A pressure cooker can cook the same types of delicious recipes that a slow cooker can and so much more, but cook them substantially faster (click for pressure cooker recipes). How about making a cheesecake in a slow cooker? Or hearty oatmeal for breakfast? Can't be done. Click for our pressure cooker time charts to see just how fast a pressure cooker is compared to a slow cooker. To get the maximum flavour when cooking beef, the beef should be browned. This browning is called the Maillard reaction which is named after the French physician, Louis Camille Maillard, who discovered it around 1910. When using a slow cooker to cook beef, this requires using an extra pan to brown the meat. With a pressure cooker, the beef can be browned right in the pressure cooker saving the washing of an extra pan. This means more convenience and time for you. Similarly, the browning reaction of sugars in, for example, an onion is called caramelization. Once again, onion must be caramelized in a separate pan before slow cooking in order to get the maximum flavour. 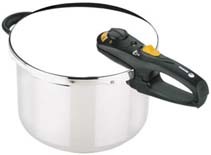 With a pressure cooker this can be done directly in the pressure cooker saving the washing of an extra pan.